So the picture above just popped into our inbox. Not really sure what to think about, but definitely wanted to share. According to this document (which could be 100% fake), the HTC Vigor will be branded as the DROID Incredible HD and then released on October 13 as the “world’s first HD smartphone.” Do we believe it? Not sure just yet. The number one issue I have is that this spec sheet lists the phone as having a 4.3″ WVGA (800×480) display that is “optimized for HD content” yet mentions the resolution as being 1280×720 and “HD” right below it. So what is it? Could be an error by a Verizon employee or could just mean the entire thing is fake. As we all know, anyone can whip up a document in Word, take a photo of it, and then pass it on as legit. 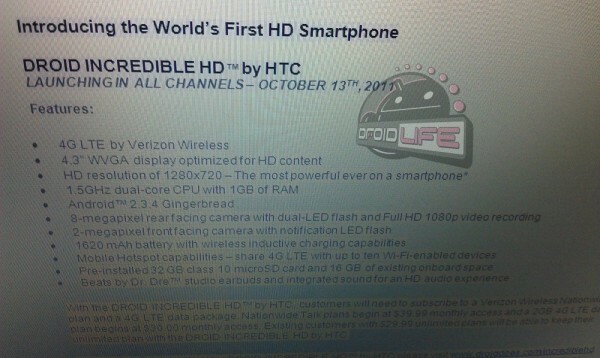 This one for the most part, looks pretty real except for that resolution part. The rest of the specs all match up to what our sources have told us in the past and this shot even lists out some Verizon contract jargon at the bottom. I for one, would love a class 10 32GB microSD card and a set of earbuds. If it’s real, then “Hooray!” If it’s fake, then this dude spent a lot of time putting it together, but obviously did not understand what WVGA meant. No Verizon logo in sight either.